Many of us spend time during the holidays with older friends or relatives who would normally live on their own. 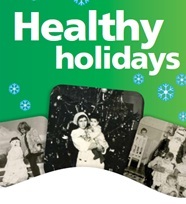 The holidays are a good time for you to look out for any changes in your loved ones health or behaviour since you last saw them. We know that for many people Christmas might be the only time that they get to see older relatives and that over the years it can be difficult to keep track of their health. The visiting older relatives guide will help you look out for any signs that all is not well so that you don’t need to panic on Christmas Day or Boxing Day when your GP practice is closed. We also know that if you haven’t seen someone for a while and they become unwell or behave differently to the way they might have done before it can be quite distressing. Sometimes this could be an early sign of an illness developing but if it is unlikely to be something that needs immediate emergency care, it could be worth waiting until you can book an appointment at your loved ones local GP after the holidays. This entry was posted in Carers, Choice, Dementia, Health and Wellbeing, Independence, Mental Health, Personalisation, Safeguarding, Social Isolation, Working together and tagged care provider, domiciliary care, health and wellbeing, independent living, integration, joint working, public health, social care, Support. Bookmark the permalink.